And so on it went. And I never did get an answer to my email. 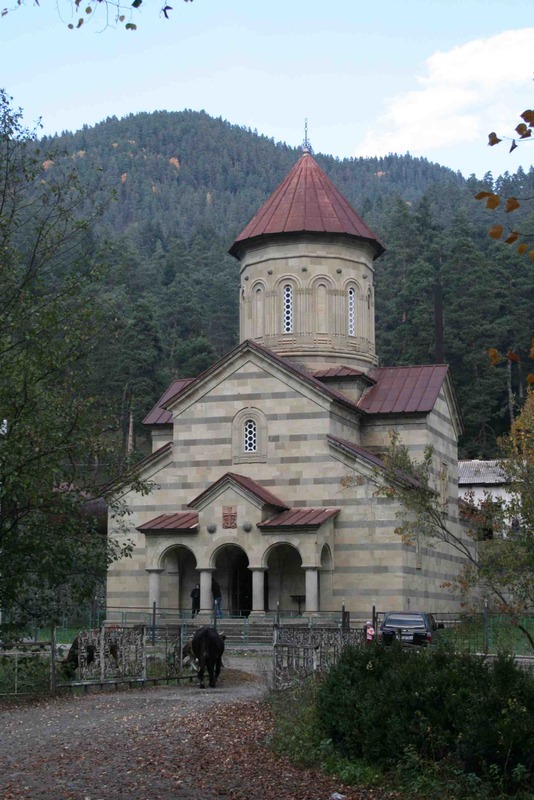 On Friday Khatuna called once again, to confirm our arrival, and everything seemed set. We met at Didube at 8:45, found our marshrutka, and we soon found ourselves back in Akhaltsikhe. From here we took a taxi to Abastumani, about a fifteen minute ride. The driver was, as are many taxi drivers and most marshrutka drivers, savagely careless; on this occasion he sped along the lanes and tried to overtake another car on a blind corner when another car approached in the other lane, honking in exasperation. He couldn’t decided whether to step on it and finish his overtaking maneuver, or retreat; after a brief lurch forward, with the oncoming car 30 meters away and honking angrily, he changed his mind and slunk back behind the car in our lane. Khatuna upbraided him roundly and he drove more slowly from then on. A savage species, these drivers in Georgia. We went first directly to the observatory, four and a half kilometers up the mountain from the pleasant little village of Abastumani. The driver dropped us at the gate, and we approached the group of 5 men squatting by the booth by the gate, or sitting on the sidewalk nearby. Khatuna informed them who we were, and that we were expected. The men looked at one another warily, and finally one spoke up. It turned out he had no idea who we were, and wondered what we wanted. She explained again our request, and our conversation with various people on previous occasions; he smiled incredulously and asked to whom we had spoken; he had never heard of any night tours. With a touch of exasperation Khatuna phoned the number we had used before, and gave him the phone. He talked briefly to someone he apparently knew, and rousing himself walked us to one of the nearby buildings and took us to his office. 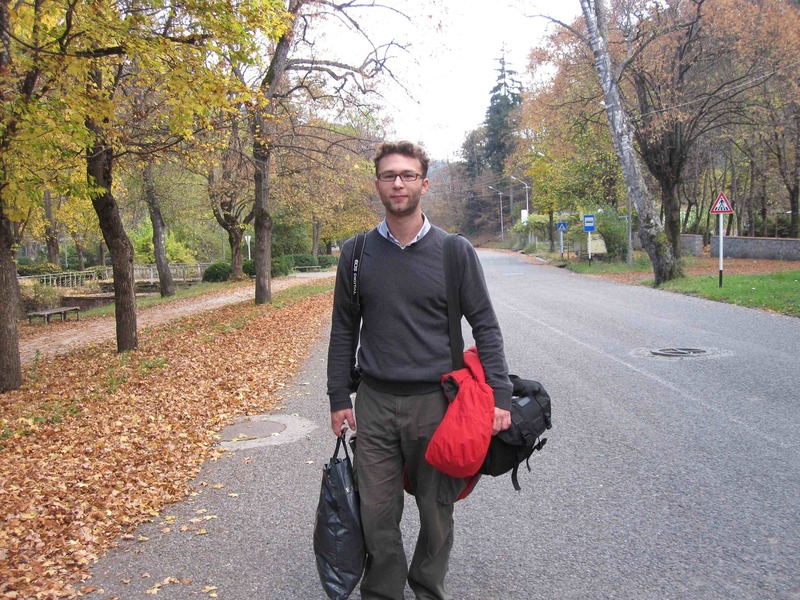 We talked for a while, and finally agreed that we would stay in his flat (for 30 lari; the hotel, it seemed, was fully booked by a school group…taking the night tour), and that we could come back around nine when it became sufficiently dark. The cable car was returning to the village below in a few minutes, so we decided to go down, have lunch and check out the town. After a decent lunch in what appeared to be the only restaurant in town, we set out to explore the place. Quite pleasant, if small and sleepy, and with the usual appearance of neglect. 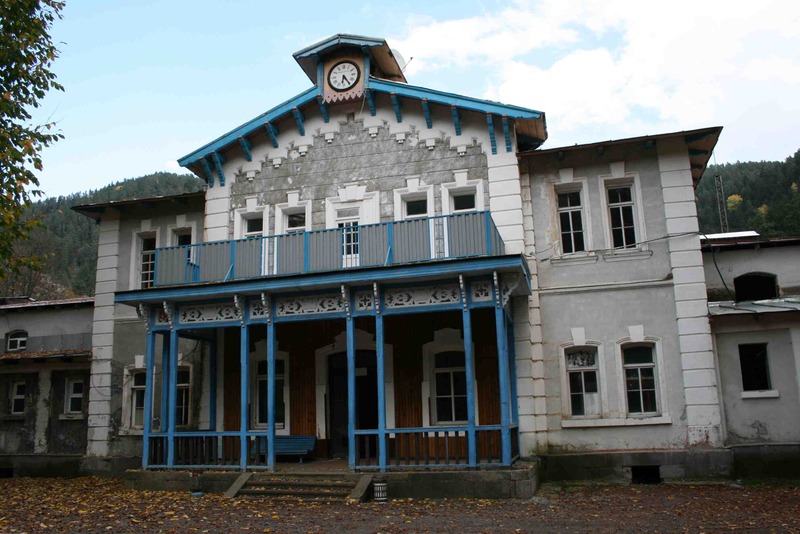 It had an unusual number of attractive tsarist-era buildings, constructed presumably when it’s waters and the wonderful mountain air attracted a more fashionable clientele. 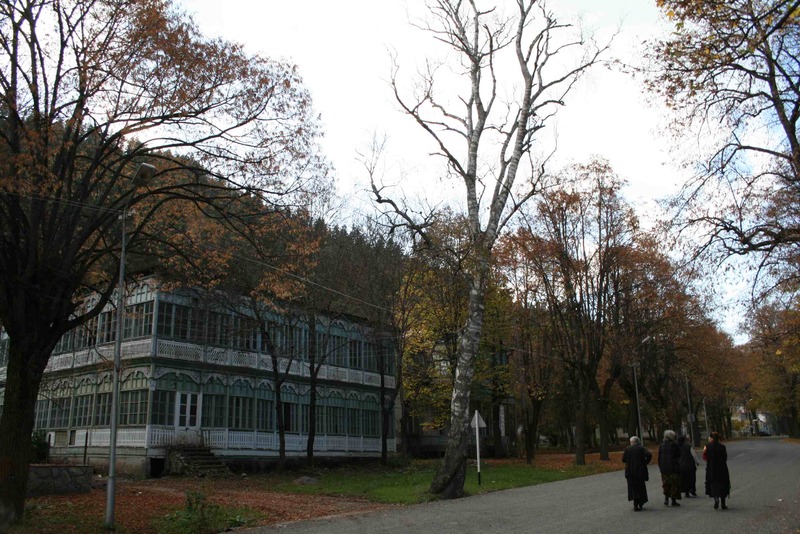 There is, I think, still a sanatorium in the neighbourhood, which we glimpsed from the cable-car, a large, dignified, white building surrounded by the pine forest that covers the whole area. We stopped at a the entrance to what was obviously a hotel, large than all the houses in the town and each of its four floors honeycombed with little balconies, most of them filled with firewood or broken furniture or building materials. 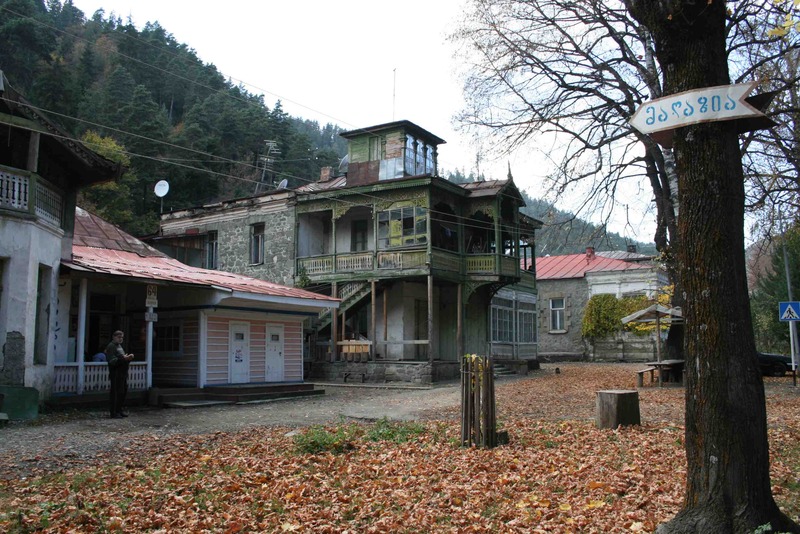 We were told that there was indeed an abano (hot spring baths), just down the road; and yes, it was open. So we followed the road through the trees, on side lined with old wooden houses where a small group of women dressed in black talked quietly while hanging up their laundry; two or three young children scampered about and stopped as we passed, looking up at us wide eyed, their toys forgotten for the moment; and an older man, hunched over on the railing of a balcony, watched us as he smoked. The baths turned out to be a disappointment; the actual building was, from the outside at least, quite pretty, although one of its two wings had been left to decay, the paint and plaster crumbling off, and virtually every window broken. The front door was open, but hanging over it was a large sign indicating that the baths were closed. We walked in anyway, rather tentatively, and were met by a tall man of about 35, with several days’ growth of beard and an awkward limp. Yes, of course the baths are open, follow me… He led us to the hallway in the wing that was still functioning, with private rooms on either side, most of which appeared to be empty, and in a dismal state of neglect: dark and grimy, broken tiles littering the floor, large patches of plaster missing from the walls, exposing the iron bars deep in the concrete, the corners filthy. The water however seemed ok; it was running water, and aside from clusters of old leaves at the bottom of the pools the water seemed clean enough. We debated briefly, but eventually the lack of towels decided it for us. So we left and turned back towards the cable-car, which would take us back up to the observatory at 6:30. Near the center of the town we passed another interesting, eccentric old wooden house, with a large enclosed balcony on the first floor. I slowly made out the letters of a sign posted underneath its windows, and discovered that it was the town’s public library. It was still early–we had a couple hours before the cable car left—so we went to have a look. 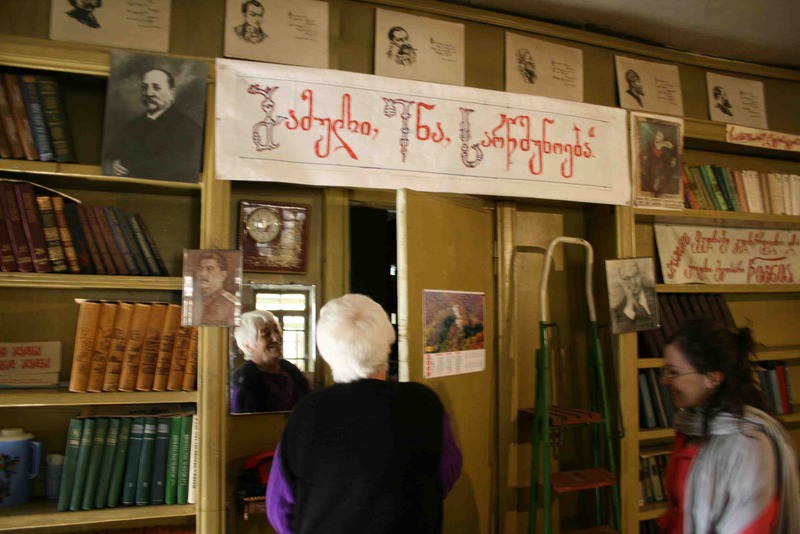 It was quite remarkable: a well-arranged, large sitting room with books and magazines lining the walls, posters with pictures commemorating various local people and Georgian literary figures, all painstakingly put together and carefully hand-written. 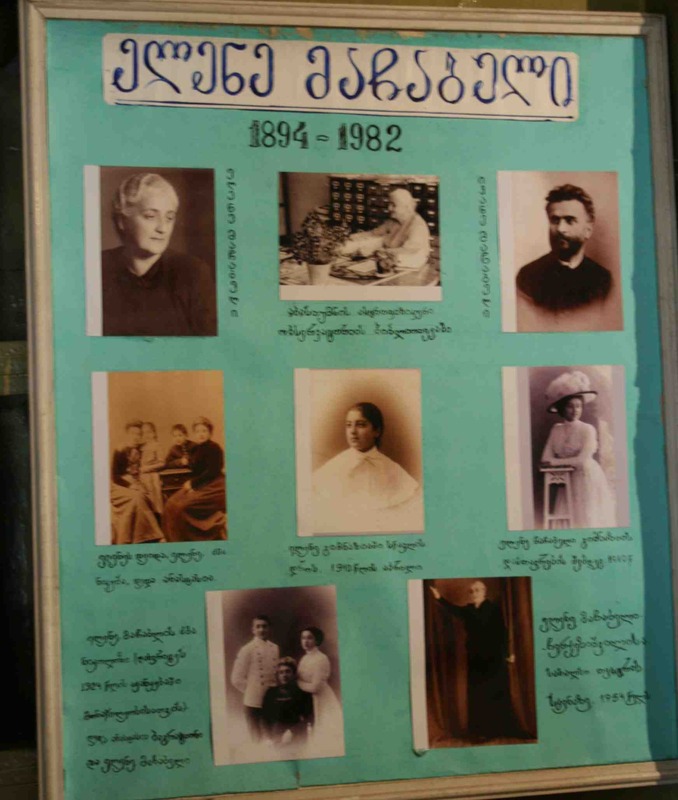 A dedication to Elene Machabeli, a descendant of the Bagrationi family and wife of the founder of the observatory. A surprisingly large collection, with around twenty well-stocked shelves. Unfortunately, no English books. It’s amusing to browse the old Soviet period books in English one occasionally finds at stalls on the streets in Tbilisi; an old Hemingway published in Leningrad in 1978, or books about England or France. I once came across a book about London published in the 1960s, surveying life in that capital with that heavy-handed ideological slant, with its slogans and simplifications, that still amazes me. 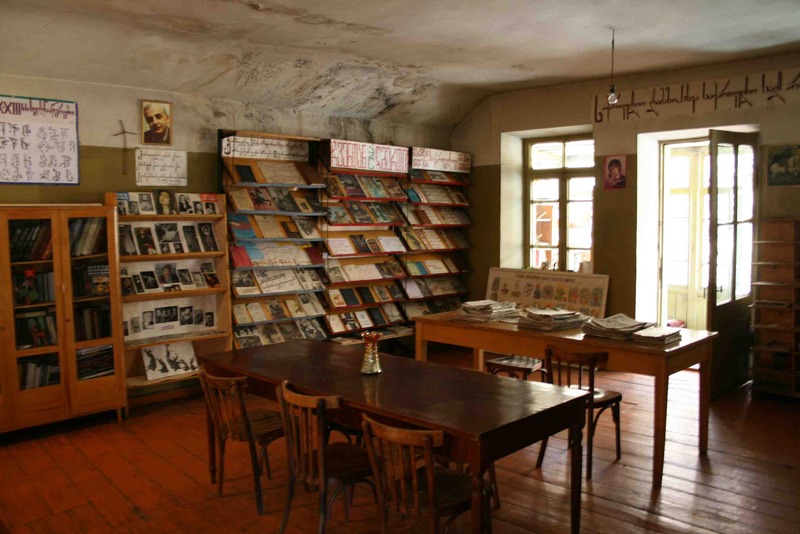 She did, however, have an extensive selection of translated literature, mostly French, English and German. Browsing the shelves the feeling again came to me that she probably had little to do, in general; most of the books were covered in a thin, undisturbed layer of dust, and cobwebs stretched contentedly in the shelves. 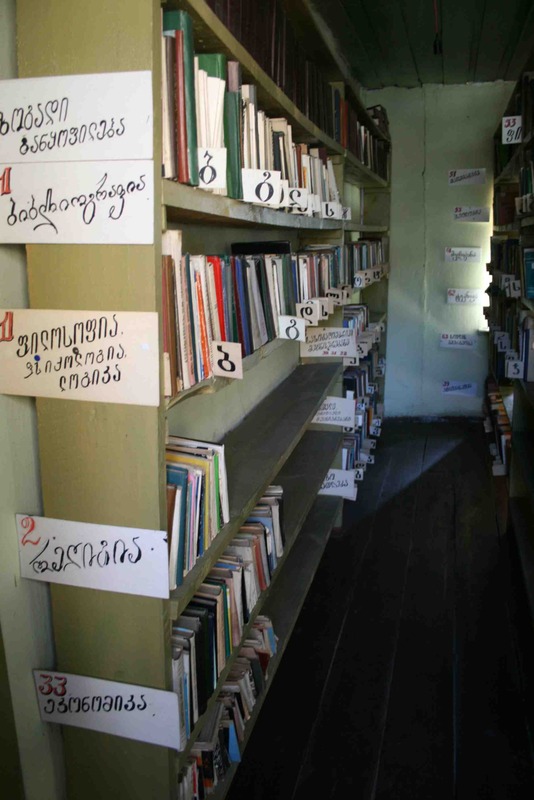 I wondered where all the books came from; I couldn’t imagine that the government had provided them all, as she claimed when I asked her—no other town of comparable size that I’d visited had such a collection. Perhaps it had been stocked at least in part by well-to-do visitors to the town in better days. 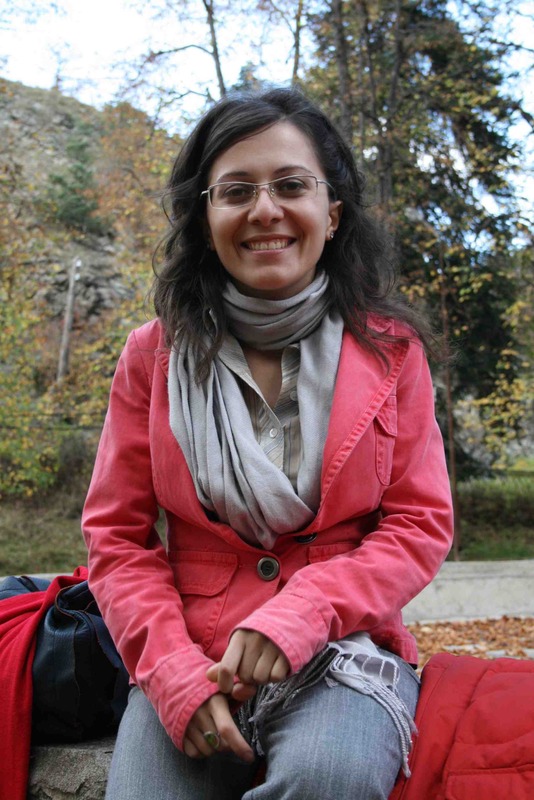 Which reminds me that she told us that the well-known Georgian poet Lado Asatiani had been a visitor. I don’t remember exactly what his illness was (probably tuberculosis), but he came to a sanatorium here when he was around 25 but promptly died. 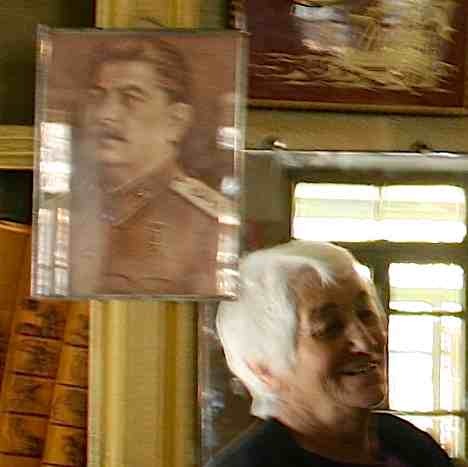 I noticed the picture of Stalin on one of the shelves, and asked her about him. She was effusive in his praise—she loved him, she honoured him; he had defeated fascism and made the Soviet Union a global power; a great man. I didn’t have the opportunity to talk much with her about him, but it was interesting nonetheless. Once outside, we saw two minibuses parked by the side of the road, with school-children loitering about. Khatuna approached one of the adults and asked if they were the group going to the observatory, and got us a ride up, still almost two hours before the cable-car left. Really a nice blog. I want to say you a very thanks to you for this. Please share some more information. Thanks for sharing this website with us. You really do very hard work on this website. I stumbled this in my account and i will come here again.